Many of the methods which deal with clustering in matrices of data are based on mathematical techniques such as distance-based algorithms or matrix decomposition and eigenvalues. In general, it is not possible to use statistical inferences or select the appropriateness of a model via information criteria with these techniques because there is no underlying probability model. 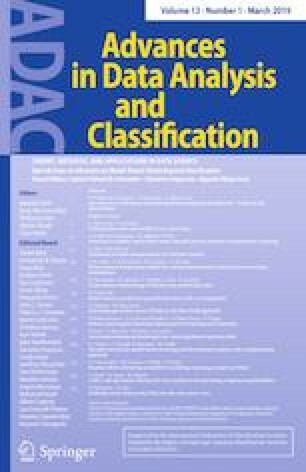 This article summarizes some recent model-based methodologies for matrices of binary, count, and ordinal data, which are modelled under a unified statistical framework using finite mixtures to group the rows and/or columns. The model parameter can be constructed from a linear predictor of parameters and covariates through link functions. This likelihood-based one-mode and two-mode fuzzy clustering provides maximum likelihood estimation of parameters and the options of using likelihood information criteria for model comparison. Additionally, a Bayesian approach is presented in which the parameters and the number of clusters are estimated simultaneously from their joint posterior distribution. Visualization tools focused on ordinal data, the fuzziness of the clustering structures, and analogies of various standard plots used in the multivariate analysis are presented. Finally, a set of future extensions is enumerated. The online version of this article ( https://doi.org/10.1007/s11634-018-0324-3) contains supplementary material, which is available to authorized users. This work was supported by the Marsden Fund on “Dimension reduction for mixed type multivariate data” (Award Number E2987-3648) from New Zealand Government funding, administrated by the Royal Society of New Zealand.